In House races where energy and environmental issues may be decisive in this fall's midterms, Democrats are gaining an edge over Republicans, reflecting broader national trends that show the GOP may be on the brink of losing its majority, an E&E analysis shows. Those Democratic candidates have increasingly been matching incumbent Republicans in fundraising. They are consolidating behind strong nominees after crowded primaries that reflect enthusiasm among grass-roots environmentalists. And they are expanding the GOP seats that will be competitive this fall. E&E News features, analysis and updates on the midterm elections. Click here to view the series. E&E News has identified 23 competitive races where land and water issues, climate concerns or various environmental regulatory issues will have significance. It represents an expanding battleground for House control. Earlier this year, E&E News cited 19 races on its green list (E&E Daily, March 6). Republicans hold a 23-seat majority in the House, so if Democrats only won the races on the green list, they would control the chamber for the first time since 2010. Most independent analysts show upward of 80 seats potentially in play, while E&E News' review focused only on those where energy and environmental issues could tip the races. Still, there remain obstacles to a blue wave in green races this fall. House GOP lawmakers have shown they can still raise substantial dollars, given that their party controls both chambers of Congress and the White House. And in some cases, intraparty Democratic jockeying may benefit Republican incumbents by leaving the strongest candidates off the ballot or drained of resources. Kyle Kondik, managing editor of the nonpartisan Sabato's Crystal Ball at the University of Virginia's Center for Politics, gives Democrats an even shot at taking back the House. "I am not jumping up and down saying the Democrats will take the House back," said Kondik, who added that with the election still six months out, plausible options range from Democrats gaining only 15 seats to a blue takeover that could net them as many as 50. Like most midterm elections, Kondik expects it will hinge on how voters view President Trump rather than on a single policy issue. He added, however, that Democrats could use the recent ethical lapses dogging EPA chief Scott Pruitt as part of a broader election-year theme that Trump has done little to clean up Washington. Democratic green-list challengers taking on some of the nation's most vulnerable House Republicans are keeping pace in raising money this year, according to the first-quarter fundraising reports for 2018 filed with the Federal Election Commission by April 15. "The strong fundraising is evidence of the grass-roots enthusiasm for candidates and winning back a pro-environment House majority," said Craig Auster, political action committee and advocacy partnership director for the League of Conservation Voters. But in some cases, the fundraising numbers also show GOP incumbents hold edges in total cash on hand. They have benefited from having been able to raise money for the past two years, compared to Democratic challengers who in many cases only declared they would run in the past year or have had to battle it out and win primaries. Rep. Leonard Lance (R-N.J.) is the most vulnerable GOP member of the Energy and Commerce Committee, after being outraised by his most likely Democratic challenger, Tom Malinowski, by more than $150,000 in the first quarter as the party coalesced around him. An assistant secretary of State in the Obama administration, Malinowski has about $740,00 in total cash on hand, compared with about $850,000 million for Lance. Rep. Carlos Curbelo (R-Fla.), the leader of the House Climate Solutions Caucus, who is seen as a top target in the Miami-area district Hillary Clinton won by double digits, raised $561,054 in the first quarter, only about $50,000 more than his Democratic challenger, Debbie Mucarsel-Powell. He does have a larger advantage in total cash on hand, with $2.1 million, compared to $702,008 for his opponent. Rep. Barbara Comstock (R-Va.), who is a major target of Democrats, given the blue wave in Old Dominion elections last year, has raised about $2.7 million to keep her suburban Washington, D.C., seat. And she will benefit from not having to spend on a primary, likely only adding to the $1.8 million in total cash on hand she has in her coffers after some early spending. 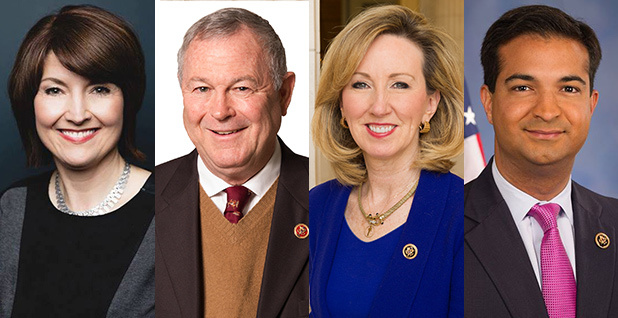 But in a sign of Democratic enthusiasm, a field of six Democrats has raised more than $4.4 million combined for a June 12 primary that will determine who takes on Comstock this fall. Similar enthusiasm for multiple challengers can be seen for Democrats on both coasts. In Maine, Republican Rep. Bruce Poliquin raised $433,566 in the first quarter, but the top Democrats competing in a June primary raised about $490,000. Among the challengers is Lucas St. Clair, whose mother donated the land and $40 million to establish Maine's Katahdin Woods and Waters National Monument. Poliquin will benefit from not having a major primary challenger and reports $2.1 million in total cash on hand. In Washington state, an open seat to replace retiring Rep. Dave Reichert (R) for the only GOP seat west of the Cascades has a strong Democratic field. The three Democrats vying for the party's nomination in an August primary raised more than $1 million combined in the first quarter, compared with about $742,000 for the expected GOP nominee, state Sen. Dino Rossi. Without a challenger, though, Rossi has been able to husband resources and has $1.5 million in total cash on hand. Races featuring the top GOP female leader in Congress, two climate change executives and a former Defense Department official who led studies on the impact of global warming are the latest to make the E&E News green list. House GOP Conference Chairwoman Cathy McMorris Rodgers (R-Wash.), the fourth-highest-ranking House Republican, is increasingly seen as top-tier target for Democrats. The nonpartisan Cook Political Report moved her race from "Likely Republican" to "Lean Republican" last month. Recent polls show her holding a single-digit advantage over former Democratic state Sen. Lisa Brown. McMorris Rodgers has been active on natural resources issues important to her eastern Washington district, where powerful dams feed water to wheat fields and there are significant timber operations. She recently won House backing for a bill sharply opposed by environmentalists to overturn a federal court decision to increase spills on the Columbia and Snake rivers to benefit salmon and steelhead. Brown has said she will make environmental issues a top priority and has received a 91 percent rating from LCV. She also served notice that she is a legitimate contender by raising $649,225 in the first quarter, which is not too far off the $772,532 raised by McMorris Rodgers. Democrats are also hoping they can made inroads in moderate Midwestern districts, including two in Michigan and one in Illinois, where the challengers are likely to emphasize environment and energy credentials. Rep. Michael Bishop (R-Mich.), a Ways and Means member, has been outraised for three quarters in a row by Democratic challenger Elissa Slotkin in a district that covers the Detroit exurbs. Both have equal amounts of total cash on hand at about $1.3 million, despite Slotkin not entering the race until last July. Slotkin, a former Obama administration assistant secretary of Defense, oversaw the crafting of the Pentagon's first Arctic strategy and its first survey of how climate change is affecting U.S. military bases. Sean Casten, a clean energy executive backed by national environmental leaders, won a crowded Democratic primary in March to take on six-term Illinois Rep. Peter Roskam, a senior Ways and Means member. The Cook Political Report rates the race a toss-up in a suburban Chicago district that Clinton won by 7 points in 2016. Casten, who is emphasizing climate change on the campaign trail, has advised companies on how to make the electric grid more fuel-efficient. He and his father ran a company called Recycled Energy Development LLC, which bought and operated power plants that sought to reduce greenhouse gas emissions through the recovery of wasted energy. Another clean energy executive, Democratic Dan McCready, has also drawn interest from greens and the national party after consistently besting incumbent Rep. Robert Pittenger (R-N.C.) in fundraising. A former Marine, McCready has led a investment firm in recent years that has raised $80 million for developing solar farms. Democrats are hoping strong resistance in California to the Trump administration could help them flip several seats in traditionally conservative Orange County. But there's increasing concern that the state's unique "jungle" primary system, in which the top two candidates advance regardless of party, may favor Republicans, with multiple Democrats splitting votes. The California primary is June 5. Rep. Dana Rohrabacher (R), a leading denier of climate change on Capitol Hill, is facing his strongest challenge in decades in a coastal district that Clinton narrowly won in 2016. His fundraising numbers have not been strong, with two Democratic challengers and a Republican outraising him in the first quarter. However, Rohrabacher could have as many 10 opponents on the ballot, most of them Democrats, and there's concern that the Democratic vote could splinter. In a nightmare scenario for Democrats, Rohrabacher and the other prominent Republican, former county GOP Chairman Scott Baugh, could take advantage of Democratic disunity and claim the top two slots for the general election. Democrats see the district just south of Rohrabacher's as one of their top pickup opportunities with the retirement of Rep. Darrell Issa (R), a longtime EPA critic. But they worry that a crowded Democratic field is making the race more competitive than it should be in a district Clinton easily carried. A recent poll shows GOP state Assemblyman Rocky Chávez clearly leading the field, with several Democrats, among them 2016 nominee Doug Applegate and environmental lawyer Mike Levin, and two Republicans in a tight race for the second slot. Other green-list races that had been expected to be competitive are now breaking for Democrats. Rep. Collin Peterson (D-Minn.), the ranking member on the Agriculture Committee, has more than $1 million for his re-election, while the Republican, Dave Hughes, who lost to Peterson by only 5 points in 2016, has raised less than $20,000 for a rematch. The GOP had hoped to mount a stronger challenge to Peterson after Trump won the rural, farming district with more than 60 percent of the vote. Democrats in New Jersey have consolidated behind state Sen. Jeff Van Drew in the race for a partially coastal Garden State seat, held by retiring Rep. Frank LoBiondo (R-N.J.). Republican have yet to find a top-tier candidate, and the seat is now seen as likely to flip. Rep. Ryan Costello (R-Pa.), an Energy and Commerce member who is active in the Climate Solutions Caucus, was expected to have a highly competitive race but opted to not seek re-election after a court-ordered redistricting gave his district a strong Democratic tilt. Democrat Chrissy Houlahan, a nonprofit executive and Air Force veteran who was poised to challenge Costello, is now expected to claim the seat this fall. Agriculture bigwigs face off in Senate runoff in Miss.